When it comes time to protect data lines from electrical transients, surge suppression is often the first thing that comes to mind. The concept of surge suppression is intuitive and there are a large variety of devices on the market to choose from. Models are available to protect everything from your computer to answering machine as well as those serial devices found in RS-232, RS-422 and RS-485 systems. Unfortunately, in most serial communications systems, surge suppression is not the best choice. The result of most storm and inductively induced surges is to cause a difference in earth ground potential between points in a communications system. The more physical area covered by the system, the more likely those differences in ground potential will exist. A water analogy helps explain this phenomenon as well as any. Instead of water in a pipe, we will think bigger and use ocean waves. Ask anyone what the elevation of the ocean is, and you will get an answer of zero – so common that we call it sea level. While the average ocean elevation is zero, we know that tides and waves can cause large short-term changes in the actual height of the water. This is very similar to “earth ground”. The effect of a large amount of current dumped into the earth (such as a lightning strike) can be visualized in the same way as a wave propagating outwards from its origin. Until this energy dissipates, the voltage level of the earth will vary greatly between two locations. Adding a twist to the ocean analogy, what is the best way to protect a boat from high waves? We could lash the boat to a fixed dock, forcing the boat to remain at one elevation. This will protect against small waves, but this solution obviously has limitations. While a little rough, this comparison is not far off from what a typical surge suppressor is trying to accomplish. Attempting to clamp a surge of energy to a level safe for the local equipment requires that the clamping device be able to completely absorb or redirect transient energy. Instead of lashing the boat to a fixed dock, we can let the dock float. Now the boat can rise and fall with the ocean swells (until we hit the end of our floating dock’s posts). Instead of fighting nature, we are simply moving with it. This is our data line isolation solution. Isolation is not a new idea. It has always been implemented in telephone and Ethernet equipment. For asynchronous data applications, such as many RS-232/422/485 systems, optical isolators are the most common isolation element. With isolation, two different grounds (better thought of as “reference voltages”) can exist on opposite sides of the isolation element without any current flowing through the element. 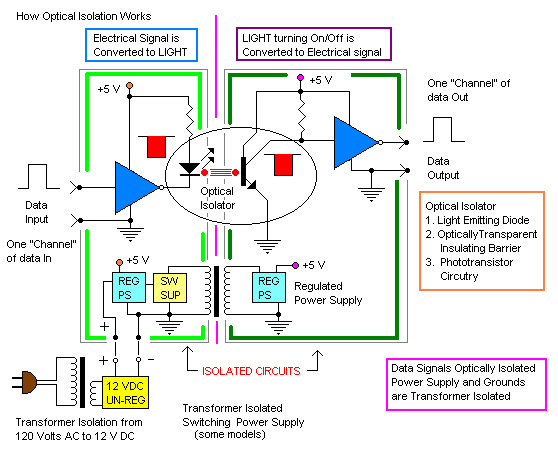 With an optical isolator, this is performed with an LED and a photosensitive transistor. Only light passes between the two elements. Another benefit of optical isolation is that it is not dependent on installation quality. Typical surge suppressors used in data line protection use special diodes to shunt excess energy to ground. The installer must provide an extremely low impedance ground connection to handle this energy, which can be thousands of Amps at frequencies into the tens of MegaHertz (MHz). 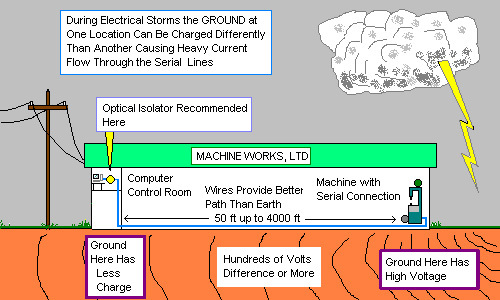 A small impedance in the ground connection, such as in 1.8 meters (6 feet) of 18 gauge wire, can cause a voltage drop of hundreds of volts – enough voltage to damage most equipment. Isolation, on the other hand, does not require an additional ground connection, making it insensitive to installation quality. Isolation is not a perfect solution. An additional isolated power supply is required to support the circuitry. This supply may be built-in as an isolated DC-DC converter or external. Simple surge suppressors require no power source. Isolation voltages are limited as well, usually ranging from 500V to 4000V. In some cases, applying both surge suppression and isolation is an effective solution. When choosing data line protection for a system, it is important to consider all available options. There are pros and cons to both surge suppression and optical isolation. However, isolation is a more effective solution for most systems. If in doubt, choose isolation.